Almost 9 years ago, I achieved a goal I’d held for many years and started an incredible journey: November 20, 2006 was my first day working for Microsoft. Based in the UK, I was a consultant working with customers helping them build awesome solutions on the Microsoft platform before moving to the mothership in the USA in 2010. I couldn’t have imagined just how amazing the opportunities would be, how awesome the colleagues I’d get to work with and the lifelong friends I’d get to make (although many are now thousands of miles away). Working on an in car entertainment and telemetry system with Aston Martin that we actually installed into an Aston Martin DBS. My buddy Dave Brown actually got to ride in the car whilst it was driven by Aston’s equivalent of The Stig around their test track in Gaydon. The work featured at MIX ’08 – video here. Working with a great team to create the Developer Foundation Assessment which later was used globally by Microsoft Services (and building a version on the original Surface). Video here. Being entered, and somehow winning the Systems Developer of the Year award at the UK IT Industry awards. I even got to meet one of my favorite comedians, Sean Lock who was giving out the gongs. There was an amazingly geeky picture of me on stage with him in the print version of computing magazine, with both thumbs up! Sadly* no digital version was ever captured and it is now lost to history (* not sadly). Being part of the small team that created the original versions of Azure Mobile Services (or Project ZUMO as it is still affectionately known internally). Some of my favorite experiences at Microsoft were the long nights leading up to that preview. It’s the closest to a startup I’ve experienced and it certainly helped plant the seed for what happens next. Presenting ZUMO at the Microsoft Company Meeting in Key Arena to over 15,000 people and of course getting to chat with SteveTM backstage. 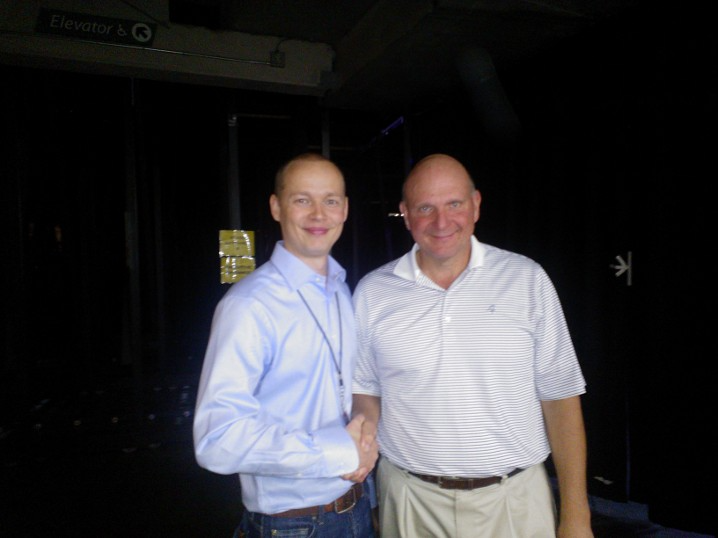 Never forget watching Ballmer rehearse his stage entrance to the music from Kanye West’s “POWER” (Not sure if the folks who chose the track had actually listened to the lyrics of the song but it was a mind-blowing way to enter an arena. There’s a very different vibe these days). For the safety of my iPhone, I had to borrow a friend’s Windows Phone for the picture below. 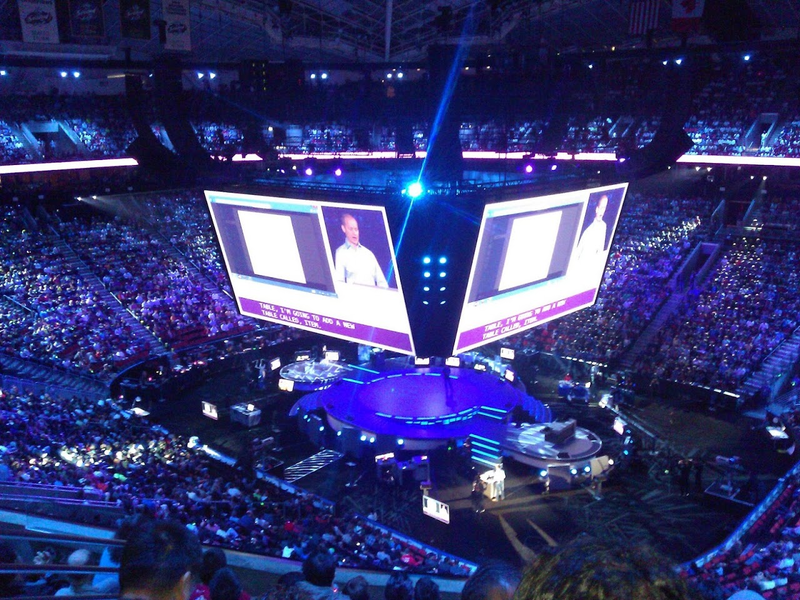 Presenting at the BUILD 2012 and 2013 Keynotes (about 6000 people each) and TechEd 2014. Nobody would believe how much work goes into these things – I have to call out my friend Nick Harris who was the real star of most of these presentations and made it all happen backstage. As a result of those keynote presentations I also got to meet Satya multiple times. He’s a genuinely nice guy and a great leader – it’s not surprising to see the company transforming with him at the helm. Launching Logic Apps as part of the Azure App Service launch. Lots of work still to be done here but the team is incredible so good things are no doubt still to come. There’s so much more I could write about – it really has been an amazing ride and I’ll be eternally grateful to Microsoft, all my managers and mentors for the opportunities that came my way. Needless to say, I’d highly recommend a career at Microsoft – but all good things must come to an end. I made the tough decision to leave Microsoft for a new but hopefully equally exciting adventure. Congrats, and best wishes for the new gig.